Imagine waking up every morning intending to make it easier for anyone and everyone to get involved in making the world a better place. As the Chief Operating Officer of Charity Navigator, I like to believe that this is my job. Then I met Craig Kielburger who, at age 12, decided that he needed to eliminate oppressive child labor policies that are destroying young lives. Craig enlisted his older brother, Marc and the two of them set off to change the world. What they created is the large, well-managed, and international WE Charity. I wouldn’t have imagined that two teens could deliver on such an extraordinary mission. Then I sat down with Craig. Craig explained that “WE makes doing good, easier.” Sounds simple, but it’s not. The We Charity includes the WE Movement (a global initiative that asks the question, “If WE don’t take action, who will? ); WE Schools (which engages students across the US and around the world with leadership and social change initiatives); WE Families (sparking multi-generational involvement); WE Well-being (to address the 70% of mental health problems that have their onset during childhood or adolescence); WE Villages (a holistic approach to international sustainable development goals that initiates new schools, improves access to food and drinking water, high-quality health care, and new jobs); and WE Day (a network of 17 live arena and stadium-sized events hosted in the USA, Canada, UK, and the Caribbean). The WE Charity is headquartered in Toronto, with a sister US-based 501(c)(3) nonprofit rated 4 stars by Charity Navigator, and over a dozen affiliates around the globe. Together WE offers resources to help students and adults create positive social change in our communities and around the world. 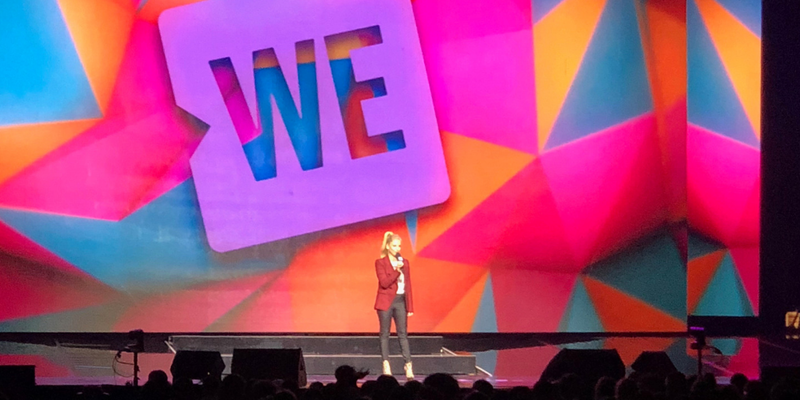 WE Day UN was held in New York City this week – coinciding with the meeting of the UN General Assembly and specific sessions with UN Women, UNAIDS, and UN Global Compact. More than 13,000 public school students attended the WE Day UN event held at Brooklyn’s Barclay Center, cheering throughout the four hours of uplifting performances and inspiring appearances by Martin Luther King III, Ndaba Mandela (grandson of Nelson), Nobel Peace Prize Laureate Juan Manuel Santos, Alexandria Ocasio-Cortez, Kareem Abdul Jabbar, Angie Martinez, Sofia Carson, and many others. Upcoming WE Day events are scheduled for Edmonton, Alberta (Oct 12), Winnipeg, Manitoba (Oct 30), Ottawa (Nov 14), Vancouver, BC (November 21), We Day Connect WEBCAST (Nov 29), Montreal (Feb 11&12, 2019), United Kingdom (March 6, 22019), Dallas, Texas (March 27), St. Louis (April 3), Baltimore (April 10), Louisville, Kentucky (April 16), Los Angeles (April 25), Chicago (May 8). To more information and to donate to WE Charity, please visit their Charity Navigator profile or their website. For information on how you can volunteer at or attend a WE Day event, please visit the FAQs at WE.org or ask your child’s school.